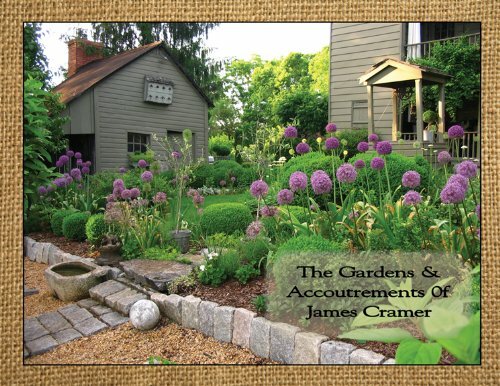 James Cramer, of Seven Gates Farm in Maryland shares his abundant gardens and wonderful collection of garden related antiques in this 136 page hardcover book. You will remember Cramer's first book, Seasons at Seven Gates Farm. This will give you a look in to how his gardens have changed and evolved into the beauty they are today. Published by Jill Peterson, from a Simple Life Magazine and author of Homecoming, The Settlement and Fragments, this is a must have for any gardener, OR for any country antiques lover. An excerpt from the book: "The first fifteen years of my childhood were spent living with my great-grandmother in her white farmhouse at the edge of a small town. Her large garden, mainly vegetables, started at the back door and took up the entire yard. There was a path down the middle that led to the old chicken house. I later came to realize that this was a victory garden and my great-grandmother wanted to be self-sustaining during and after the war. . . For the last thirty years, I too have lived in an old farmhouse with gardens surrounding the home, at the edge of a small town. It is said that you are impressionable the first years of your life and now I see where my love of gardening came from. I realize that the things I do now all came from my growing up years - even canning. I realize as I get older how important that time with my great-grandmother was and how it has shaped me as an adult. . . "